I received word yesterday that one of the military heroes of our time, and my one-time boss, General Norman Schwarzkopf, had died. I served as his personal Arabic interpreter during Operation Desert Shield and Operation Desert Storm in Saudi Arabia, Kuwait and Iraq. He was 78 years old. I first met General Schwarzkopf at the Pentagon as he was on his way to his new position as the commander of the United States Central Command (CENTCOM), headquartered at MacDill Air Force Base, Florida. I was assigned to the Defense Intelligence Agency (DIA), serving as the Assistant Defense Intelligence Officer for the Middle East. As part of his orientation to his new command, my boss and I briefed the general on our recent support to Saddam Husayn and the Iraqi military in their eight year war with Iran. As part of that effort, I spent much of 1988 in Baghdad as a liaison officer to the Iraqi armed forces Directorate of Military Intelligence. It was though our provision of intelligence that Saddam's forces were able to defeat the Iranians on the battlefield. When the Iraqis invaded Kuwait in August 1990, President George H.W. Bush declared that the Iraqi occupation of Kuwait "will not stand." A few days later, the President ordered General Schwarzkopf to begin the deployment of American combat forces to Saudi Arabia to defend the kingdom against a possible Iraqi attack. Almost immediately, the general himself moved to a forward headquarters in Saudi Arabia. General Schwarzkopf was in need of an Arabic interpreter to help him deal with his Arabic-speaking allies as well as his Arabic-speaking enemies. 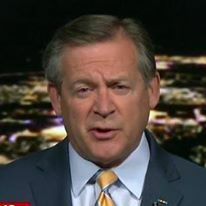 I received a call at home from a senior officer (and friend) at the Central Command headquarters, asking me if I was interested in being General Schwarzkopf's personal Arabic interpreter - I jumped at the chance, but was concerned that DIA might object. I was wrong - DIA was happy to provide my expertise, or as they put it, "supporting the warfighter." I also learned later that Chairman of the Joint Chiefs of Staff General Colin Powell had put out the word: "when CENTCOM calls for support, the answer is yes." I was on the ground at CENTCOM Forward in Saudi Arabia in two days. General Schwarzkopf was interested not only in my Arabic language skills, but my previous experience in Iraq with the Iraqi army and air force. While in Baghdad in 1988, I had worked with several of the same officers that were now facing us in Kuwait and southern Iraq. One of these officers was Major General Wafiq al-Samarra'i, the Director of Military Intelligence (DMI) for the Iraqi armed forces. In 1988, Wafiq (then a brigadier and deputy DMI) was the officer I worked with in providing intelligence information on Iranian targets. By virtue of the information we had provided, he had gleaned some insight to our intelligence capabilities, and would be using this information in his assessments and analysis for Saddam Husayn. Likewise, I had gained an appreciation for Iraqi intelligence and military capabilities through not only working with intelligence officers in Baghdad, but by traveling to the battlefields and observing the Iraqi army and air force in their operations. Soon after I began my duties at CENTCOM, I was called to meet with the general. He asked me if I could teach him to speak Arabic. I replied - with all due respect - that I could teach him some basic conversational things, but learning Arabic is not a part-time endeavor. After I tried to get him through some basic greetings, the press of preparing to invade Kuwait and Iraq ended, thankfully, the language training. I felt privileged to sit in on what I knew was going to be history. I, too, was a Vietnam veteran (I was previously a Vietnamese linguist) and was a small part of the rebuilding of the American armed forces into the most lethal and effective killing machine in history. The Iraqis may have been able to defeat the Iranians (with our intelligence assistance), but they were not going to be a match for the best-trained and best-equipped military in the world. The result was a foregone conclusion - the only question was how much American blood it would cost. It was easily one of the highlights of my career. I wrote a book about my experiences in Iraq in 1988 and my later service as General Schwarzkopf's interpreter and advisor. The book can be found in libraries or online. Years later, I was hired by NBC News to appear on their family of networks as a military analyst providing my insights into the 2003 American invasion of Iraq. 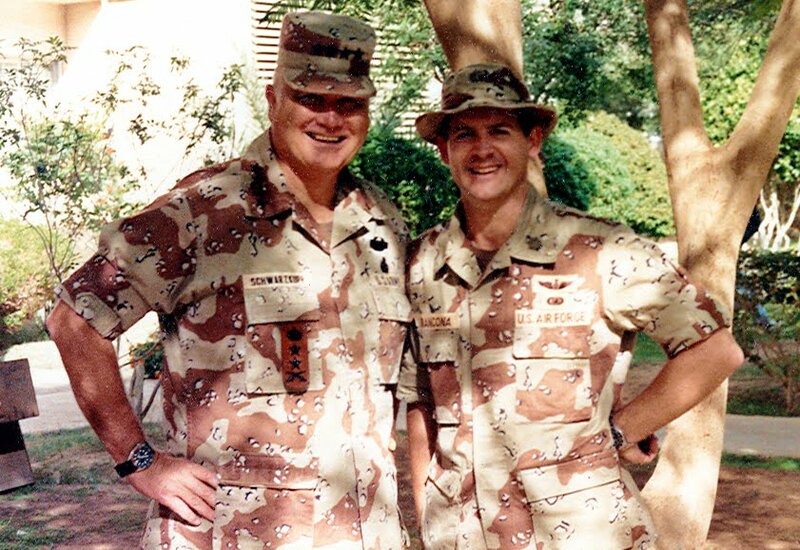 One of my fellow military analysts was none other than retired General Norman Schwarzkopf. We appeared on camera together a few times. I will always remember his kind words, "As you well remember, Rick, when we took on Saddam...."
Right, general. You and me. It was an honor and privilege to have served as his interpreter. It has, at times to my dismay, defined my military career. No matter what I did before or after that - and I like to think I have made some real contributions - I am best remembered as "Rick Francona, he was General Schwarzkopf's interpreter." Four Syrian army soldiers captured by the opposition Free Syrian Army (FSA) confirm that the Syrians have launched Scud missiles at opposition targets in the country. This video was posted on YouTube by the Free Syrian Army unit calling itself the al-Qalamun Volcano (burkan al-qalamun) Brigade. The FSA captured these four soldiers of the Syrian army 51st [Missile] Battalion of the 155th [Missile] Brigade. The 155th Brigade is headquartered near the city of al-Quyafah, located at 33°44'23"N 36°35'53"E. There are large missile garrison areas just southwest of the city. The soldiers gave their names when asked. When the interviewer asks who is responsible for missile operations, the prisoner second from the left provides the information. He responds with the name Staff Colonel 'Ali Yusif Hamudi, commander of the 51st Battalion, and brigade commander Ahmad Ghanam. When asked who else, the prisoner responded with the name Staff Colonel Dhahir Hadad, commander of the 78th [Missile] Battalion. At time code 1:01, the prisoner said that they had fired seven missiles, five during the day and two at night. He confirmed that he had witnessed the launches, and that they were launched at Darat 'Azah (36°16'47"N 36°51'36"E) in the Aleppo Governorate. Comment: Darat 'Azah has been the scene of intense fighting over the last week. It is adjacent to the garrison of the Syrian army's 111th Regiment at 36°15'35"N 36°53'38"E that was seized by elements of the FSA last week. ADDENDUM - Syria about to use chemical weapons on its own people? This is an addendum to my earlier article, Syria about to use chemical weapons on its own people? This Syrian opposition video shows chemical warfare protective equipment seized following a battle between the opposition and the Syrian army on the road between Damascus and the Damascus International Airport. That area has seen some of the heaviest fighting and regime air strikes over the last month. During the past few days, the opposition has surrounded the airport in hopes of shutting it down. Several airlines have canceled flights to Damascus. According to new reports citing "U.S. officials" as the source, the Syrians have prepared some of their chemical weapons for use. It is one thing to prepare the weapons, but there is another, equally important factor in the employment of chemical weapons - you must protect your own troops who have to operate in the chemical environment. In the intelligence business, the deployment of chemical warfare protective gear is a key indicator of potential chemical warfare use. This video indicates that the Syrian army is issuing protective gear to its combat units. I have gisted the Arabic narration on the video, keyed to the time code. 0:01-1:10. This materiel was seized by the Free Syrian Army (FSA) during a battle with regime forces on the [Damascus International] airport road. It consists of chemical warfare protective equipment carried in ZIL-131 vehicles. There are suits, coveralls, overshoes, filters, boxes of combat chemical protective suits. 1:10-1:33. This is decontamination equipment found in the ZIL-131 trucks. You can see the hoses, brushes, decontamination fluid and other materials. 1:50-2:00. These are Russian chemical warfare protective filters. 2:05-2:40. This is how the suits are worn. This gear is now in the hands of the FSA, and will be used to protect ourselves in case of a chemical attack by the regime. * I am not sure this is accurate. Since all of the other gear appears to be defensive, I suspect it is more decontamination fluid. Pretty sobering. If the Syrians are not planning to use chemical weapons, there is no need to issue this protective gear. Syria about to use chemical weapons on its own people? Is Syrian President Bashar al-Asad about to order his armed forces to use chemical weapons on their own people? According to media outlets citing "U.S. officials," the Syrian military has mixed the chemical components that make up the nerve agent Sarin (GB). 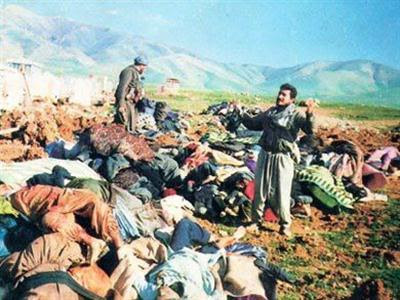 Sarin has been used in the past in neighboring Iraq - in 1988, Iraqi Air Force fighters dropped Sarin-filled bombs on the Kurdish town of Halabjah in northern Iraq, killing over 5,000 people. Later that year, Iraqi forces used chemical weapons against Iranian troops during four major battles, making Iraq the only country to have used nerve agents on a battlefield. Unclassified Report to Congress on the Acquisition of Technology Relating to Weapons of Mass Destruction and Advanced Conventional Munitions, 1 January to 31 December 2006. (Read the entire report). Chemical and Biological. Syria continued to seek dual-use technology from foreign sources during the reporting period. Syria has had a chemical weapons program for many years and already has a stockpile of the nerve agent sarin, which can be delivered by aircraft or ballistic missile. In addition, Syria is developing the more toxic and persistent nerve agent VX. We assess that Syria remains dependent on foreign sources for key elements of its CW program, including precursor chemicals. Syria's biotechnical infrastructure is capable of supporting limited biological agent development. We do not assess the Syrians have achieved a capability to put biological agents into effective weapons, however. Ballistic Missile. Syria's ballistic missile program is a key component to its strategy to deter external threats and is a priority in defense planning and spending. Syria possesses one of the largest ballistic missile forces in the Middle East—composed of Scud-class liquid propellant short-range ballistic missiles (SRBMs), including Soviet—and North Korean—origin Scud missiles. Additionally, Syria fields the SS-21 Mod 2 SRBM. We judge that Syria's operational missile force can employ chemical as well as conventional warheads. Syria is developing a version of its Scud-D missile with greater accuracy and that is more difficult to intercept. The Obama Administration has reacted with its usual vapid rhetoric. "Today I want to make it absolutely clear to Asad and those under his command: The world is watching. The use of chemical weapons is and would be totally unacceptable. If you make the tragic mistake of using these weapons, there will be consequences and you will be held accountable." If Bashar al-Asad thought there would really be serious consequences, he would not have given the order to his armed forces to ready the chemical weapons. Just like al-Asad's primary sponsor and supporter - Iran - the Syrian president does not take American threats seriously. I hope Bashar is making a serious miscalculation. I hope that I have underestimated Barack Obama's understanding of the situation in the Middle East. I have been to Halabjah - I have seen the results of nerve gas attacks on defenseless civilians. I have been to the Iraqi battlefields in 1988 - I have seen the results of nerve gas attacks on Iranian troops. Perhaps this is a gamble on al-Asad's part - "Someone grant me asylum or I'll go out with a bang." If Bashar al-Asad descends to the level of Saddam Husayn and does use chemical weaspons, he needs to suffer the same fate as his Ba'thi cousin - delivered by either the Syrian people or an American missile. Unfortunately, our record of holding people "accountable" is pretty weak. Obama Administration opposes tougher Iran sanctions? The Obama Administration's rhetoric, usually delivered by Secretary of State Hillary Clinton, maintains that the United States will not allow Iran to develop a nuclear weapon, and that this Administration has imposed crippling sanctions on Iran. Despite that, the President has threatened to veto a bill imposing even tougher sanctions on the Islamic Republic. That does not seem consistent. For those of you who do not follow the Middle East sections of the media, here's what is happening. In an unusual bipartisan move, the U.S. Senate voted 94 to zero to amend the defense authorization bill with sanctions further restricting trade with Iran. The new sanctions would apply to precious metals, graphite, aluminum and steel, metallurgical coal and software used for integrating industrial processes. These are the types of materials that can be used in a nuclear weapons program. This amendment ups the ante in American efforts to cripple those sectors in Iran - this will get the attention of the decision makers in Tehran and not just an impose further economic hardships on the Iranian people. So why does the Obama Administration oppose this step, a step that might actually have an impact on the recalcitrant regime in Tehran? You would think the President would welcome sanctions that would help him achieve his commitment to prevent the fundamentalist Shi'a regime from acquiring a nuclear weapons capability. Despite the Administration's previous efforts - these "crippling sanctions" Mrs. Clinton keeps touting (mostly forced on it by the legislative branch), the Iranian nuclear program continues virtually unhindered. According to chief of the International Atomic Energy Agency (IAEA), Yukiya Amano, the current international sanctions protocols have not had any effect on Iran's nuclear activities - the Islamic Republic continues to enrich uranium at a steady pace, and shows no signs of changing their policy. Sanctions have had an effect on the Iranian economy - inflation is rampant and the value of the Iranian rial has virtually collapsed. While that has hurt the average Iranian, it has done nothing to hinder progress towards the development of nuclear weapon. There is another policy that has not hindered Iran's nuclear program. It is the Obama Administration's repeated efforts to negotiate a resolution to this crisis - efforts which began as soon as Barack Obama took office in 2009 and have periodically resurfaced each time the Iranians offer to talk yet again. The Iranians, much more skilled in Middle East bargaining than the seemingly naive Barack Obama, have never agreed to anything except to meet again for more talks. There has been no positive result whatsoever from the Obama policy of "engagement." 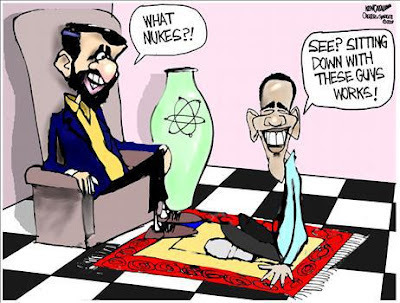 While the Iranians agree to talk about talks, the centrifuges at multiple facilities continue to enrich uranium. The only chance of a peaceful resolution to this crisis is to force the Iranians to negotiate. Thus far, the sanctions and offers of "engagement" have only worked to Tehran's advantage. Unless the United States, the United Nations or the rest of the world can impose truly draconian sanctions that get the attention of the regime, negotiations will fail. If negotiations fail, there will be one of two outcomes. Either the Iranians will be successful in acquiring nuclear weapons, or the Israelis will assess that the Iranians are close to such capability and mount an attack on the facilities. Either outcome is problematic, to say the least. That said, if sanctions are going to be effective, they have to be strong. The Senate amendment is a start. The President needs to accept the fact - quietly so that he does not have to admit failure - that the Iranians are not going to fall victim to his wit and charm. Go for the sanctions.